People in the US hold over $1 trillion in credit card debt. Credit cards are the most essential source of day-to-day financing for millions of Americans. Yet little is known about the true demographics of who owns credit cards, how much they charge on them, and whether they pay their balances on time. The information we have is based on surveys, and people are notoriously bad at accurately reporting their finances. Participants had to agree to share their data to be part of this. To account for people who declined, Stavins made some statistical adjustments to keep the results nationally representative. Stavins found that people tend to overreport the number of credit cards they have, underreport their balances, and greatly undervalue their credit limits. But most importantly, by combining demographic data from the Fed’s survey with Equifax, we finally have accurate public data about how different groups of people use credit cards. The survey was conducted in 2015 and 2016. The data show that whether a person owns a credit card diverges hugely by age, income, and education. Overall, 74% of adults have a credit card, but just 48% of those under 25 have one, compared with 87% who are 65 or over. The difference is even greater across education and income levels. Credit card balances also vary hugely. 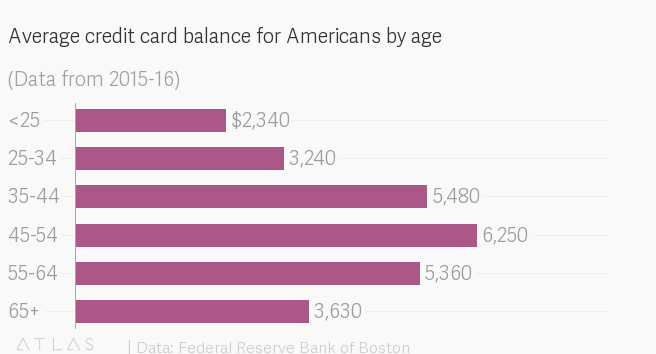 While the average American maintains an average balance of $4,560, this is highly dependent on age. Balances are relatively low for the young, about $2,340 for those under 25, but grow as people get into middle age, reaching over $6,000 for people 45-54, before falling as they get older. At the peak of a person’s earning power, typically in middle age, they are given larger credit limits from card companies. Finally, the analysis estimated the share of people who have “revolving” credit card debt—meaning they don’t pay off their balance in full at the end of the month. Stavins found that 44% of adults have revolving credit, and these people typically have an outstanding balance of $6,600. Revolvers are generally poorer and less educated than the typical American. It is worrisome that financially strapped Americans are incurring high interest payments on credit cards that reduce their already modest incomes, writes Stavins. Yet she also notes that credit cards offer the poor a source of funds that may help them through tough times that would otherwise be worse.